Christmastime breeds nostalgia. The holiday atmosphere, full of traditions, encourages everyone to think back to Christmases past, back when things were the same but also a little different. Over the years, the X-Men have had a lot of Christmas celebrations, with some turning out better than others. The thing a lot of them have in common is UNCANNY X-MEN #98, the X-Men’s first holiday issue. For modern readers, this landmark issue is full of nostalgia. At this point in X-Men history, the core X-Men members are still trying to understand what it means to be a family. Compared to modern comics, where they’ve already been through everything with each other, an issue like this is a trip down memory lane. UNCANNY X-MEN #98 begins Jean Grey’s journey to becoming the Phoenix, so even without its holiday undertones, it’s a must-read for X-Men fans. This issue is also just an example of early X-Men team bonding. 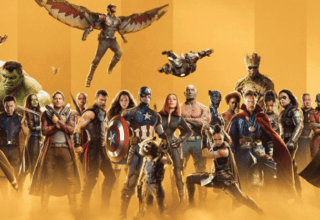 At this point in the series, characters like Storm and Wolverine are still fairly new, so they’re trying to settle into the team and find their “place” amongst the veteran members. While I love the witty banter that comes from the team being together for years, seeing their relationships at this fledgling stage is both insightful and kind of adorable. 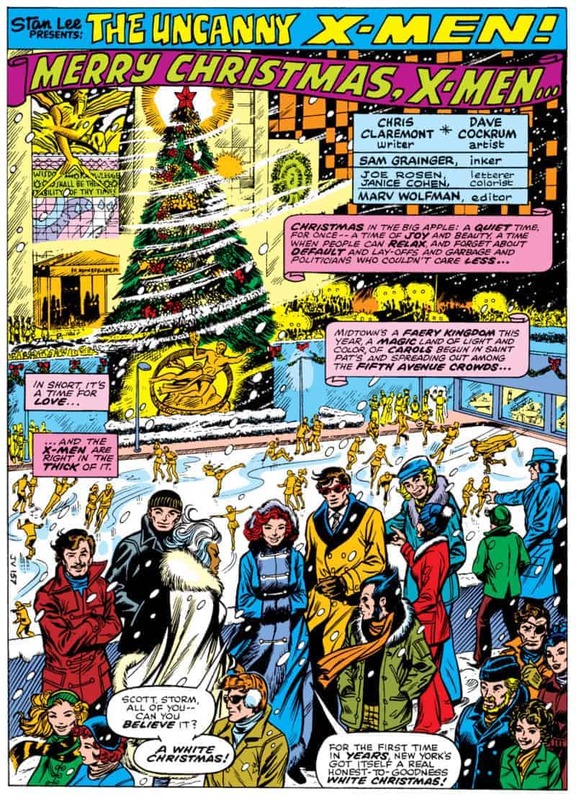 Written by Chris Claremont and illustrated by Dave Cockrum, this issue opens up with a beautiful Christmas scene in Rockefeller Center. Cockrum is a master at building landscapes, and he really shows that off here. The snow circling around the giant tree and the dozens of ice skaters tracing the rink just says Christmas. The entire team, including Banshee, Colossus, Wolverine, Nightcrawler, Cyclops, Storm, and Jean Grey took the day off to enjoy the recent snowfall in New York City. Everything seems to be looking up for the X-Family. 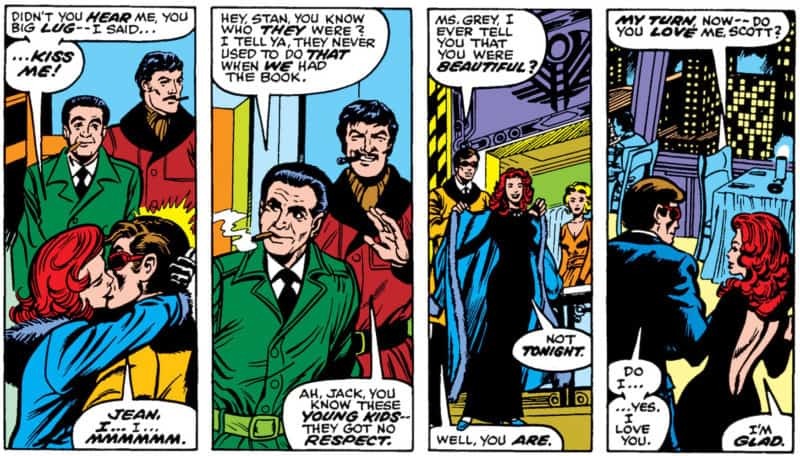 Stan Lee and Jack Kirby even make an appearance, remarking on how much the times have changed. Unfortunately, we really only see the X-Men’s holiday festivities for a few pages, because before the team can do anything normal, Sentinels attack the restaurant Jean and Scott are dining at. At this point in the X-Men history, Sentinels weren’t as popular. This issue is the first time characters like Storm and Nightcrawler have ever even seen a Sentinel. 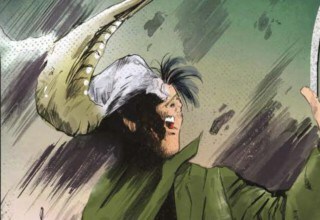 Jean and Scott take the brunt of the attack, with Jean becoming captured in the process. While readers get to see Scott’s optic blasts at full power, Jean’s telekinesis is surprisingly weak. Of course, in a few issues she becomes the Phoenix, so I’m willing to ignore that little hiccup. 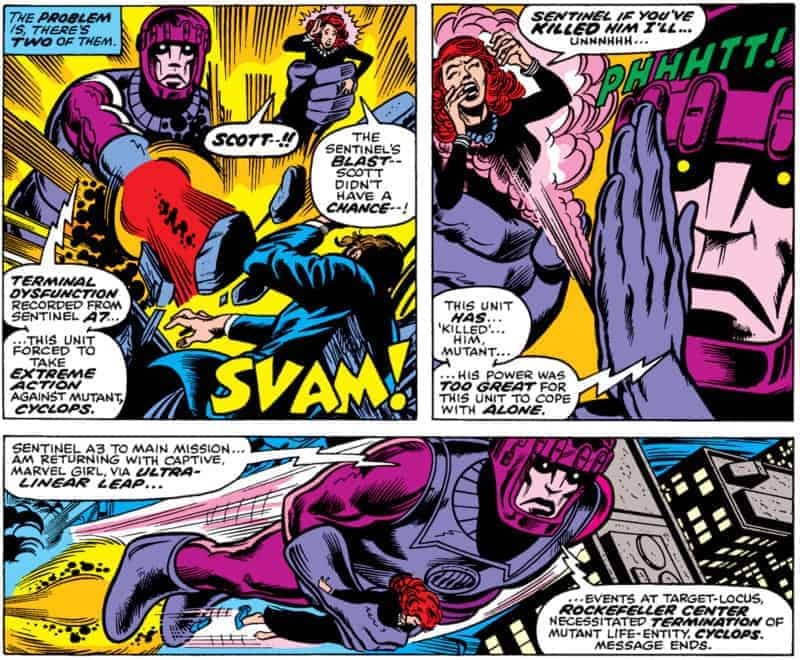 The other X-Men are able to save Scott and stop one of the other Sentinels before it causes any more destruction. 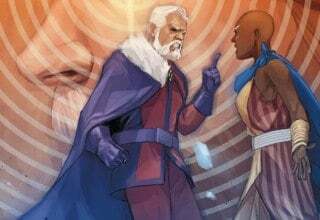 Storm uses her ability to spontaneously create hurricanes to take down the giant robot. Unfortunately, she also almost annihilates half of Manhattan while she’s at it. 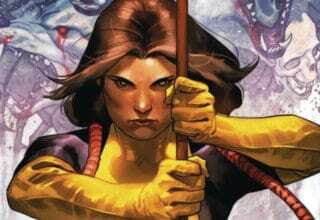 She’s still a fledgling X-Men member after all. During the battle, a Sentinel was able to capture Banshee and Wolverine, taking them back to X-Men villain Steven Lang’s villainous lab. Professor X ends up there too, leaving the X-Men seriously under-manned. Wolverine and the others are able to escape, but they don’t get too far since Lang’s lab is in space. Cue the beginning of the (first) Phoenix arc! You’re probably asking yourself right now: “Why would anyone call UNCANNY X-MEN #98 a holiday issue? There’s hardly any mention of the holidays.” Aside from the Christmas scene in the beginning, that’s true. 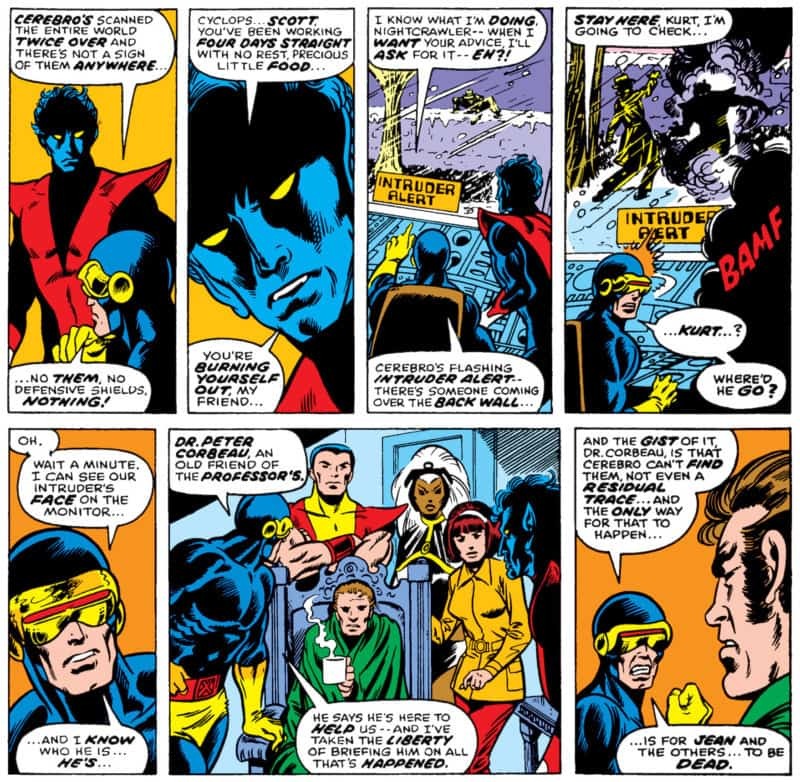 Still, I consider it a holiday issue because of what the X-Men go through in a few short pages. The X-Men are, at their core, a (dysfunctional) family. In UNCANNY X-MEN #98, during their first Christmas together, they’re trying to form that bond. 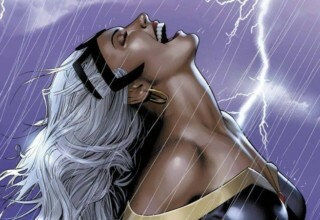 The original members are already very close, but the newer members are still acclimating to the X-Men family dynamic. When Land separates them, that bond is tested for the first time. Compared to some of the holiday issues that proceed UNCANNY X-MEN #98, Claremont’s story isn’t particularly jolly. 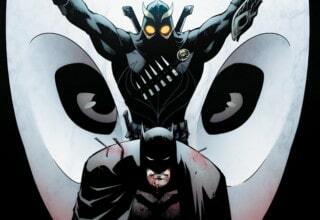 However, for a comic book, it’s scarily real which is why it works. Christmas is about spending time with your family. 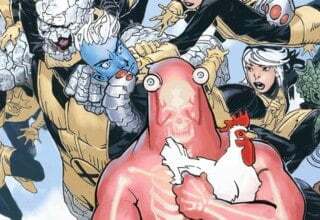 In this issue, the X-Men lose their sense of family because of Steven Lang. They’re forced to grapple with the fact that they’re all emotionally tied together. When one of them is gone, it affects them all. 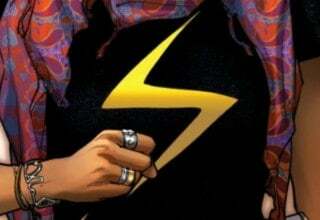 Modern X-Men comics show the classic characters as a tight-knit family with an extensive past. While it’s always great to see Storm and Jean’s close friendship on-panel, it’s also nice to see where and how that friendship came to be. In this issue, the risk of being an X-Men member becomes apparent. Even on Christmas, the X-Men don’t get a day off. In a way, the X-Men have to ask themselves whether forging those tight bonds is worth the risk. 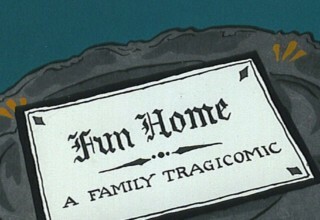 When someone can get hurt so easily, is becoming a family really the best idea? While we all know that the eventual answer is “yes,” a lot of the characters in this issue are struggling to decide. It’ll take a few more issues until they’re certain.